After survey shows more than 20% of haredim won't vote haredi parties, deputy health minister claims election results will be different. 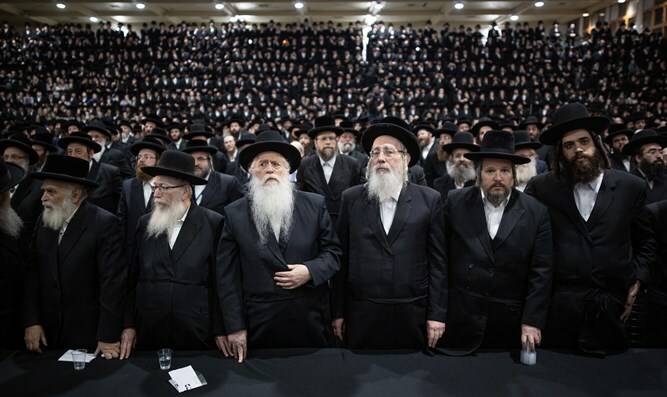 Deputy Health Minister Yaakov Litzman (United Torah Judaism) doubted the reliability of a survey that determined that more than 20 percent of haredim would not vote for haredi parties. "I don't think that 20 percent of haredi voters would vote for a secular party; we did a lot for the public and there's no reason why that public shouldn't return the favor at the polls," Litzman said in an interview with Kol B'Rama radio. In a parallel interview with Radio Kol Hai, Litzman made it clear that the haredi spectacular would no longer happen. "As soon as I was offered unity with Shas, I agreed, but unfortunately it did not happen, and not because of me. The haredi big-bang won't happen. I brought my rabbis' consent to run together with Shas. Unfortunately this didn't come to fruition. In the end it won't happen." He called for unity in the right-wing bloc. "We don't want to lose votes from our bloc and hope the Right unites." A public opinion poll expert revealed that without unification of parties twelve Knesset seats could be lost and a leftist government might arise even though there may be more votes to the Right. Litzman criticized Aryeh Deri for his call to convene the two Councils of Torah Sages and to call on Orthodox parties - Ashkenazim for United Torah Judaism and Sephardim for Shas. "I didn't like Deri's call for a meeting of Councils. It's their own matter and it's not suitable to recommend what Israel's leaders should do, but we'll work together closely," he said.